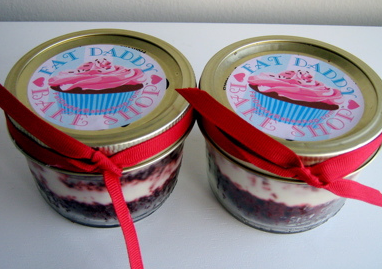 These little red velvet cakes in a mason jar are the perfect way to say you love your loved ones this year! Combine the wet ingredients with the dry ingredients a little at time, mixing after each addition, just until combined. Generously grease and flour two round, 9 inch cake pans with shortening and flour. Bake in the middle rack for 30-40 minutes, or until a toothpick comes out clean. Do not over bake as cake will continue to cook as it cools. Let cool on a cooling rack until the pans are warm to the touch. Remove the cakes from the pan and let them cool. Frost the cake with cream cheese frosting in layers in the jars. Thanks for sharing this great recipe...and cute idea!!! Wondering where you got that cute print on the top of the jar?